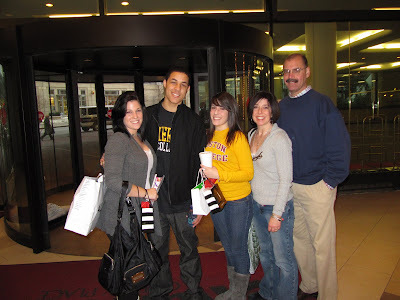 I know I have posted this picture before...it's from our college tour trip to Boston for our daughter Kelsie and Courtland, our oldest daughter Courtney's boyfriend. I'm doing this post for Courtland, because we love him to pieces...hi Courtland!! Courtland is a senior in high school and is off to college in September. He is a very hard worker, super smart and loves, loves, loves music. Here's where the request comes in...Courtland and his friend George entered their song in a radio contest and were chosen to be in the final round...kind of like an American Idol. If they are picked, their song will be played on the radio next Monday on Jammin 107.7. It's a very big deal and we are so excited for them. They both wrote the lyrics and Courtland did the music for the song. Here is a link to the contest. If you would like to listen to their song and watch their video, it's listed under the title "George". You can vote for them at the bottom of the page. Just use the drop down link and click on "George". They did a live audition with only an hours notice to get there. I think they were great! If they win, they will be on radio and win a cash prize, which will help with their college bills!! Thanks for helping them out and for voting!! ps...it's a nice "clean" song about meeting a girl and Courtland is the one in the shorts in the video!! What a great job Courtland, voted already! Have a great day. Listened, Voted, great job!! good luck! PS In your picture, I could not pick you out Karen!! I just listened. They got my vote.